Today was more sunshine, it’s not too dark anymore, but still a little bit cloudy. Anyway, I thought I go out for a short hike and to take some pictures. I saw small birds again, and today they seemed to be a little bit more relaxed. You know, birds like to fly from one branch to another, and that makes it difficult to get a nice photo, but today that was easier. The Robin in the photo of this post for example did let me come close, I was only 2 meters away, and then I used the 300mm of my tele lens and took the photo. The bird seemed to be very curious about me and my camera. Before I shot the photo of this post, I shot photos with every step I came closer, just in case the bird would fly away and I would miss a shot. When I was 2 meters close, I noticed that my Tamron lens did start to hunt for the focus, it tried to get the branches in focus but not the bird, and I decided to focus manually. However, this means I had to trust my eyes and that I would focus correctly through the viewfinder. The result was a blurry photo, but I could fix it a little bit with the sharpening slider in Lightroom. I wish the photo would be a little bit more crisp, but it’s not too bad now. Maybe I shouldn’t be that close at 300mm, maybe the lens needs some distance at 300mm to get the subject in focus, or I really just didn’t focus well manually. But as said, I still like the photo, and apart from that, it’s practicing and having fun with the camera. I might upload the photos where I was a little bit more far away, because they are super sharp, but I want to see how they look like if I crop a little bit, that is something I will check out. Hehe, yes. the Robin watched me with every step. I am sure it would have flown away if I would have gone one step further. 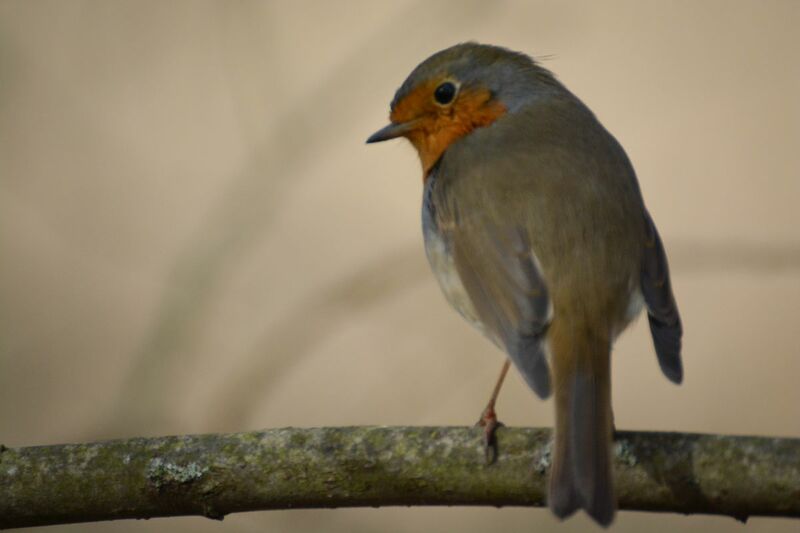 I am glad the Robin did let me take that shot. I went away and it was still sitting on the same branch. But for some reason the birds have been more relaxed today. This robin is much cuter than the American Robin!